Forget about harassing search of stuff in the handbag. 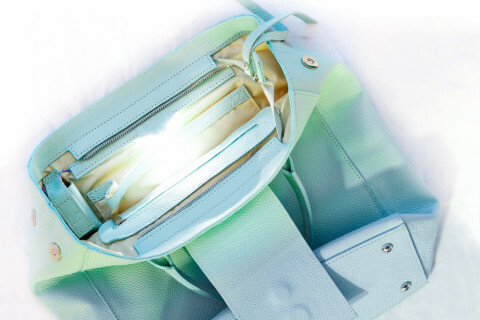 Exclusively designed for Bright Inside Bags integrated LED light system turns the lights on automatically when you open handbag and turns off when close. Forgot to close? No worries! The bag turns off light automatically. Moreover, Bright Inside LED light system is conveniently integrated providing directional light straight into the bag – not in your eyes. Wholly dedicated to a vision of style we are inspired to create handbags combining wearable technology and fashion thus bringing to life brand new products – Bright Inside Bags. The handbag is easily charged through USB output, 3 light indicators in the bag show charge level: the bag is completely charged and ready for usage when all 3 indicators light up. Your world moves with you all day long. From early morning till late night you are fully ready for adventures with Bright Inside tech savvy handbag: charge you mobile phone whenever you need it to be always in touch.